Captain Eddie’s guests enjoying our balmy October weather! In terms of the guide business we are very thankful for the wonderful late fall weather we have had the last few weeks, and our focus has been on fixing up our fleet of Grady White’s. If you are running your own boat, now is a perfect time fix everything on the boat as its comfortable out and still warm enough even for paint projects. In terms of fishing reports, the Cap Mouth is pretty much a wrapped up done deal. There are the occasional fish, and I have heard of the odd fish being caught, but I wouldn’t recommend it for the rest of the season. So, if you are heading out, option one (especially good if you have your boat near the South Arm), is Sand Heads would be one spot to try for the upcoming days. While most coho and chinook are already up the river, historically, this time of year is when the main flow of chum have come through. While each year is different, looking at the Albion Test (nets) for both 2016/2017 some of the best numbers of chum were in the October 10-20 range, so that is an option for sure. 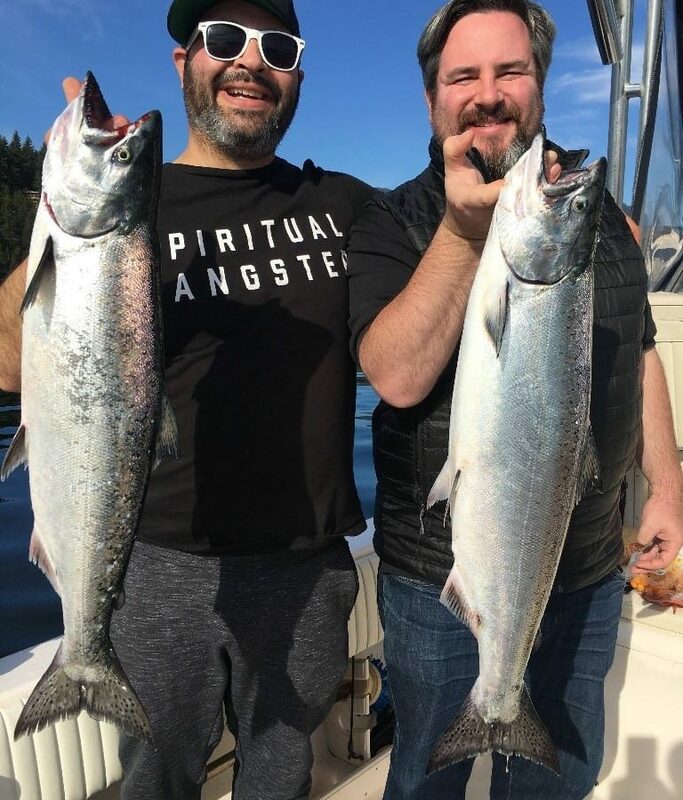 For gear, everyone has their own style, but a start depth is 40-60 on the rigger for chum, troll slower, just like sockeye fishing, and just like sockeye, hoochies seems to be more productive than both bait and spoons. For flashers, I like black/glow, purple haze, and purple phantoms. Some guides prefer chartreuse. My preferred setup is 62 on one rigger, and 57 on the other, putting a dummy flasher on the cannon ball, then the first live line 10 feet up. If currents allow, I would use a second live line (at another 10 spread) up the cable. If you are not getting them there, go deeper, as the fish can be anywhere from surface down to 150 feet. If you have your sockeye Michael Bait setups still, they work well for chum too. Option two is to head up Howe Sound and prospect for some feeder/winter chinook. Our guide boats have been doing just that lately and have found a few fish . These fish are aggressively feeding, hard to find, but usually easy to get to bite if you find them. Troll fast, fish close to the bottom, and look for bait. 18 lb balls are better, as it allows you to troll faster, covering more water, and since most action is off the bottom, a 2-rod setup is recommended. These fish are deep, between 100-250 on the rigger, so glow flashers are a must. My favourites are the BC, Madi, CB 55, and Salty Dawg, Chartreuse Glow and Green Onion Glow. If you are fishing deeper than 150 feet, a double glow flasher is a good idea as well. My go-to spoon for this fishery is the Kingfisher 3.0 Irish Cream, other great colors are Homeland Security, Herring Aide, Yellow Tail and Kitchen Sink.